Co-Flex-Nl Self-Adherent Bandages: This Is A Self-Adherent, Latex-Free, Hand-Tear Compression Wrap That Is Ideal As A Secondary Dressing Without The Need For Clips Or Tape. It Allows For Better Compression Control Than Other Self-Adherent Wraps Because It Will Not Constrict Once Applied. Each Bandage Is Individually Wrapped. 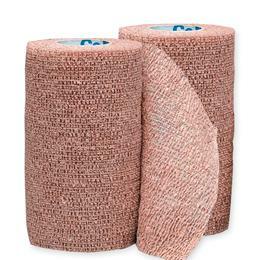 Non-Sterile ' 2" X 5 Yd, Color Pack (Neon Pink, Blue, Purple, Light Blue, Neon Green And Red).